Two months ago, the residents of Prestige Shantiniketan in Whitefield, Bangalore, saw around twenty trees pruned down to 4 feet. Recently they also came to know that another 491 trees are waiting in the queue to be cut. They claim that the trees are 11-year-old. 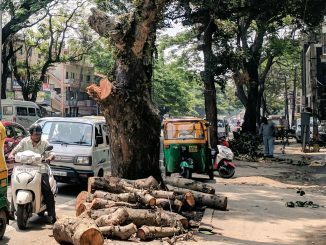 The plan to cut 491 trees was envisaged by the Management Committee of Prestige Shantiniketan, who are worried that 500 trees are on an elevated slab or a podium, and will damage the podium structure. 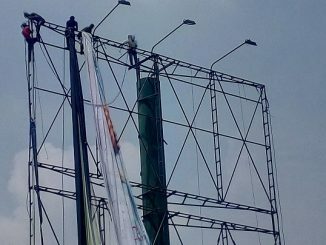 They are concerned that the podium will not be able to take the weight of fully grown trees (approximately 200 tonnes) and the soil (approximately 1 lakh tonnes). According to a few residents who did not want to be named, trees to be cut include Ashoka (Saraca asoca or Saraca indica), Neem, Sausage Tree (Kigelia Pinnata or Kigelia Africana), African tulip tree (Spathodea Campanulata), Yellow Flame Tree (Peltophorum Pterocarpum), Silver Oak, Crape Myrtle (Lagerstroemia Parviflora), Honge, Coconut Palm, Date Palm and Sandalwood. Citizen Matters could not verify this indendently. Except Silver Oak, Date Palm and Coconut, cutting of all other trees, under section 8(7) of the Karnataka Tree Preservation Act (KTPA) 1976, requires prior permission from the Tree Officer (TO). One is liable to be imprisoned for a period of three months or with a fine extending upto Rs 1,000 or both. The court may also order seizing of any property in respect of which the offences is committed. Under Karnataka Forest Act 1976, Chapter 10, section 83 prohibits a person who has Sandalwood trees in his property from cutting it, either to sell or to possess it. If anyone violates this, under section 86, the person is liable to be imprisoned upto 10 years and can be fined Rs. 1 lakh. Sreenivasa explains that a complaint can be lodged at a local police station by anyone who finds any of these protected species being cut. Section 17 of KTPA gives power to Tree Officer to arrest a person without an arrest warrant, for violating the law. However he has to provide appropriate reason to the Magistrate of that jurisdiction within 24 hours. According to the residents, the idea of cutting these trees surfaced last year, when one of the residents raised alarm about the possible negative effects. However, the matter was put in the back burner. This year, the new management committee decided to listen to the warning and height of 20 trees were pruned down to 4 feet from 12 feet. Brijesh Kumar, Chief Conservator Forest Officer, BBMP calls the act of pruning as pollarding. Pollarding means cutting of top branches of a tree to the trunk so that it may produce a dense growth of new shoots. He adds that if the diameter of the trunk is not more than 15 cm at a height of 1.37 meters, then such an act can be called as illegal. If the diameter is more than 15 cm, then it is not illegal, he adds. Brijesh Kumar says that trees should be planted, but not anywhere. He says that if the trees are planted on an elevated podium with 3 feet of soil depth, it can harm the structure. “Personally, I would have given permission to cut the trees,” he adds. After receiving complaints about the trees proposed to be cut, Kumar sent Tree Officer Satyanarayana to inspect the place. Satyanarayana couldn’t personally visit the place so he sent his junior officer for inspection. Professor S Girish, Department of Civil Engineering, BMS College of Engineering, who has been in the field for last 27 years, was of the opinion that the roots of some trees can damage the slab beneath the foundation over a period of time. He said, “If the slab is of high strength concrete like M60 grade, damage can be minimised/ avoided if the workmanship is good.The slab should not have any seepage and needs to be dense. However, since the moisture/water is always there for trees the slab needs to be protected against seepage by means of some chemical treatment and periodical maintenance.” He also says that the structure may go through any kind of distress like shrinkage crack and creep effects, as the age of concrete goes on increasing. He recommends avoiding of planting trees over the slab, and to periodically inspect the slab for any kind of distress. Prof. K B Reddy, who is an erstwhile member of the Managing Committee of Prestige Shantiniketan, says that the information that the residents have is factually incorrect. “The age of any tree on the podium is not more than five years. Construction of the residential complex was started late in 2005 and hence no tree was planted prior to 2010 on the podium. There are no sandalwood (Santalum album) trees in the list of 491. There are two small juvenile Sandalwood plants (One self sown and one planted by us) in the entire Prestige Shantiniketan and they are not on the podium. None of the six Ashoka (Saraca indica) trees are proposed to be removed. Every effort is made to transplant and grow them elsewhere if anyone is removed,” he clarifies. “It is not just about the load on the podium but about several other problems including the long-term direct and indirect consequences,” he adds. Landscaping architects suggested pruning of all tall, large and heavy trees planted on the podium every three to four years, to grow them as Bonsai, which was not done by anyone. “The real tree lovers of Prestige Shantiniketan (Green Initiative and Equal Sky) including Volvo Motors have planted 700 saplings all along the periphery. We have the best, rarest and the greatest tree diversity in Prestige Shantiniketan… we have the most experienced experts in all disciplines in the Prestige Shantiniketan. We love trees and care to follow rules,” Reddy clarifies, in a comment to this article. Meanwhile, a few residents have convinced the management not to go ahead with the cutting of trees. They urge that due diligence should be followed before cutting more trees. The current load-bearing capacity of and weight on the podium, current weight and total soil weight on the podium, total weight and projected maximum weight of the trees on the podium, trees and their root systems etc should be calculated. Only problematic trees should be removed or transplanted, with due permission from BBMP. The residents also demand that alternative plan should be provided to compensate for the trees removed. Did you like this article? Help us publish more such articles. Support Oorvani Foundation! The Whitefield apartment found the soil depth could not support large trees. Seepage and structural safety influenced the decision, says PSN Management Committee. It is disheartening to see Citizenmatters publishing stories without checking facts. Prestige Shantiniketan, as is widely known by all, didn’t get completed until 2010. The plants were not planted on the podium until after the completion of the project. So in the worst case scenario, no plant/tree on the podium can be more than 4 years old. Furthermore, the article has completely ignored 100s of plants that have been planted by residents in various locations in the campus. My family was also involved, like many other families, in planting many plants, and adopting them for regular upkeep. This article and the source are misrepresentation of reality and very unfortunate. The information provided by some of the residents is factually incorrect. The age of any tree on the podium is not more than five years. Construction of the residential complex was started late in 2005 and hence no tree was planted prior to 2010 on the podium. There are no sandalwood (Santalum album) trees in the list of 491. There are two small juvenile Sandalwood plants (One self sown and one planted by us) in the entire Prestige Shantiniketan and they are not on the podium. None of the six Ashoka (Saraca indica) trees are proposed to be removed. Every effort is made to transplant and grow them elsewhere if anyone is removed. It is not just about the load on the podium but about several other problems including the long-term direct and indirect . consequences. In fact the landscaping architects of the builder suggested that all tall, large and heavy trees planted on the podium have to be drastically pruned and transplanted every three to four years after pruning the roots also to grow them as Bonsai. But is not done either by the builder or the property maintenance agency. The real tree lovers of Prestige Shantiniketan (Green Initiative and Equal Sky) including Volvo Motors have planted 700 saplings all along the periphery. We have the best, rarest and the greatest tree diversity in Prestige Shantiniketan. We have fruit trees, sacred trees, ornamental trees and very valuable red sanders and forest trees..
Further, we have the most experienced experts in all disciplines in the Prestige Shantiniketan. We love trees and care to follow rules.